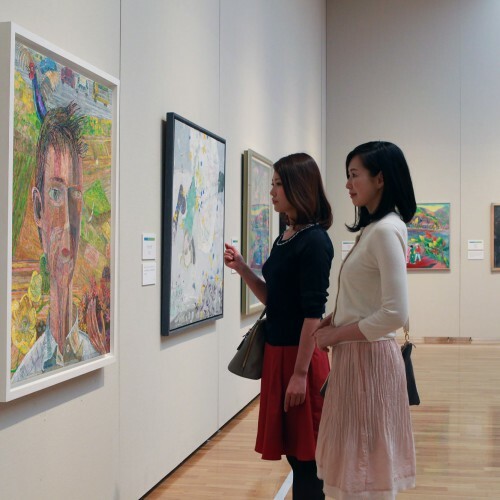 If you look at this page, how well Matsumoto City Museum of Art is known! First of all, please have a look here from the access methods up to the way of enjoying the art museum and the way of enjoying yourself after the appreciation of the works. Before the “Random Dancing of Polka Dots” bus, let’s go! For going to Matsumoto City Museum of Art, This is it! 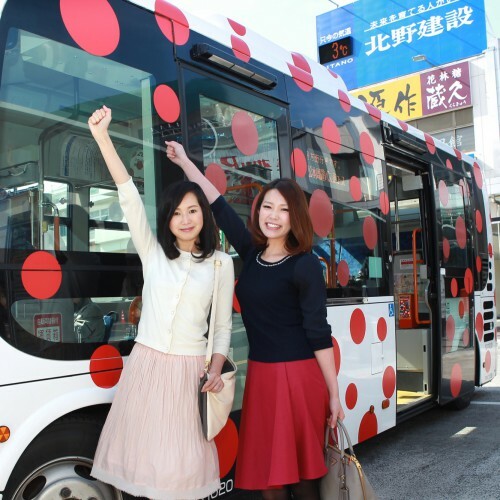 Yayoi Kusama designed “Random Dancing of Polka Dots” Bus. The polka dots which can also be said to be Ms. Yayoi Kusama’s trademark are boldly allotted on a white bus, and the Kusama world can be fully enjoyed by whole bus. Access information of a town sneaker, “Random Dancing of Polka Dots” bus, is available from an Eastern course of Castle Exit at Matsumoto Station. 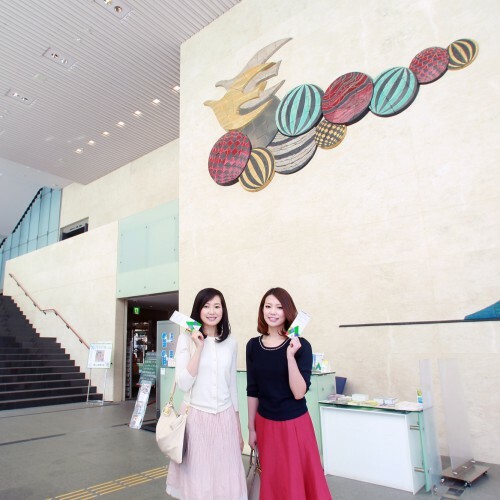 When arriving at Matsumoto City Museum of Art, first of all, it is a commemorative photo! Before Kusama Yayoi’s work, field sculpture”Visionary Flowers,2002″ bus, displayed outside beside the entrance, say “cheese”. It is a routine spot to shoot a commemorative photo. Please do not forget to appreciate Setsuo Takahashi’s “Flight” on the wall of the entrance, either. When you went up the big stairs of the stairwell, the back is a planning exhibition room on the second floor. 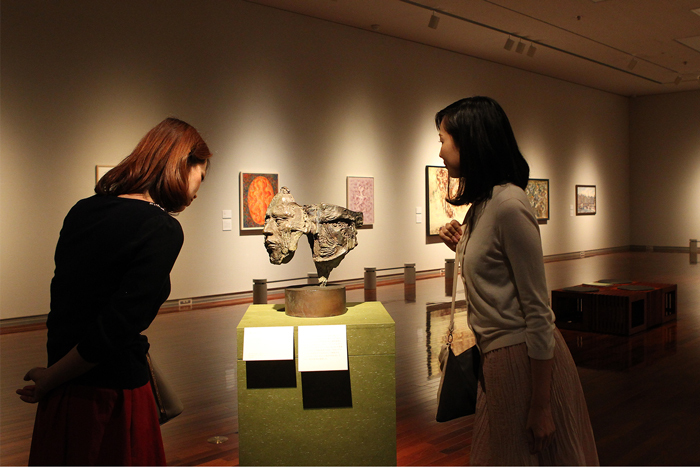 The plan exhibitions sponsored by Art Museum are held about 4 times a year. 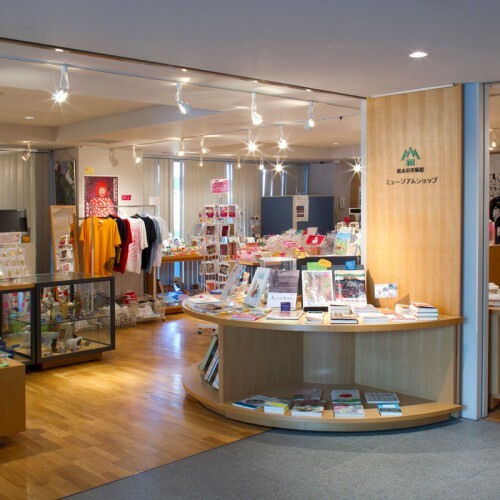 Next, if you go up to the third floor, it is a collection exhibition. 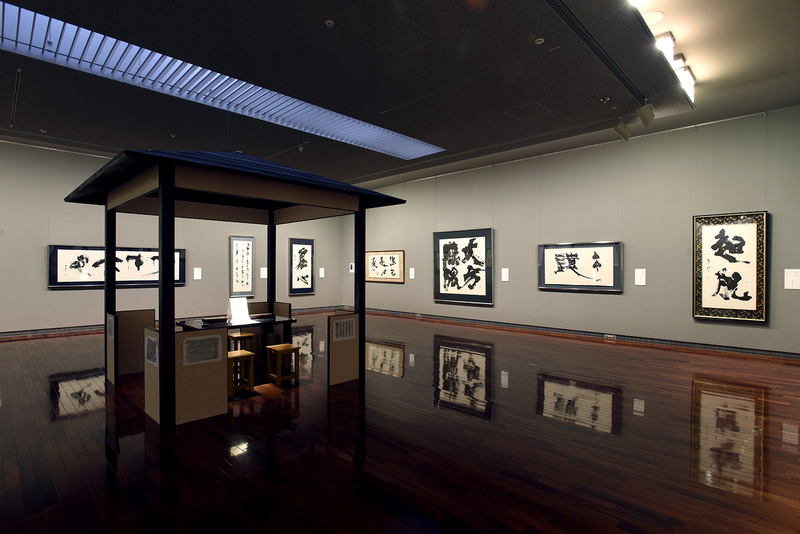 The collection exhibition is performed centering on the superb fine-arts which Matsumoto City has owned. 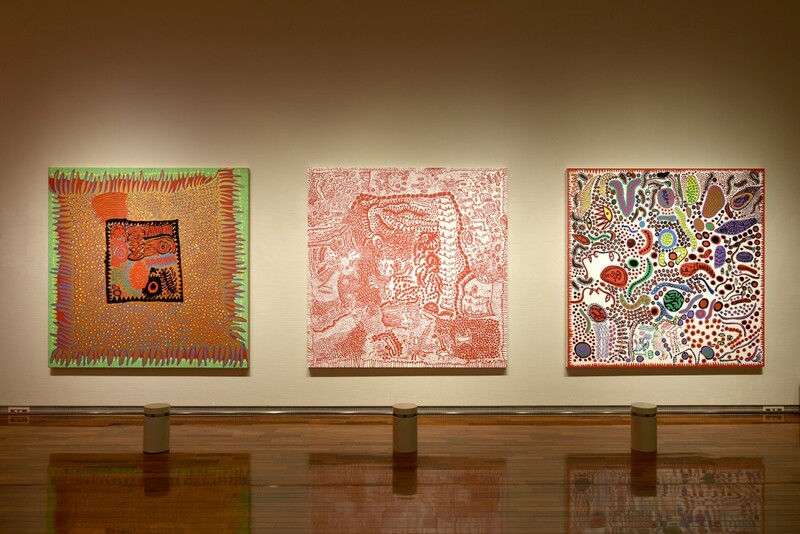 The works of Yayoi Kusama and Shinzan Kamijo from Matsumoto, and Kazuo Tamura who has connections with Matsumoto are displayed in a permanent collection exhibition room and a commemoration exhibition room. 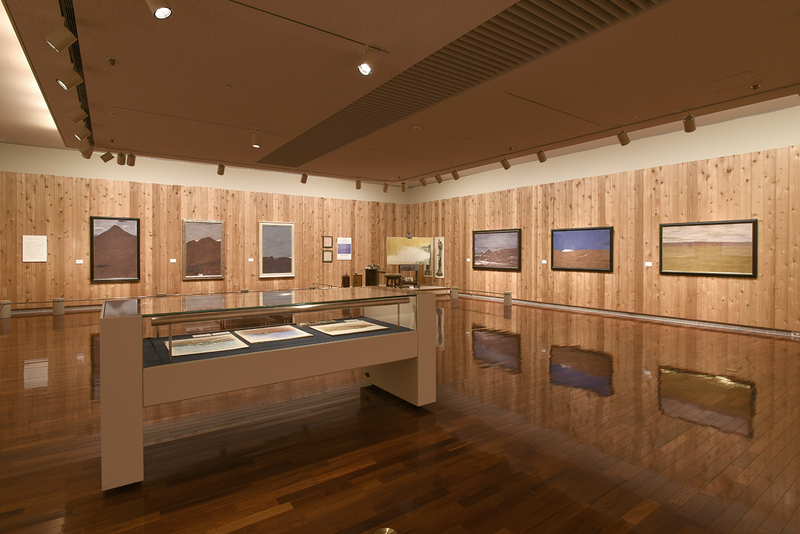 You can enjoy yourself, even if you come how many times, since the collection exhibition is also replaced by exhibition works in a fixed period. 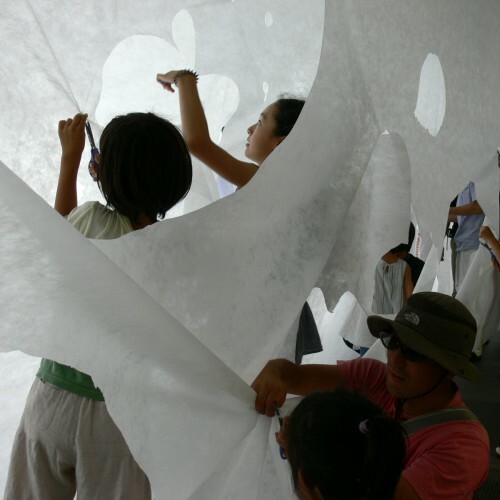 In Matsumoto City Museum of Art, various workshops besides an exhibition, the lecture, the event, etc. are held. Since it broadly plans from children-oriented exhibits to adult-oriented exhibits, it is good to appreciate them earnestly or to enjoy yourself with your family. Please come in touch on art and enjoy yourself. There is also a library. Although it is not known unexpectedly, a pleasant spot is here. It is a fine-arts information library. Of course, not to mention fine arts and art relations, there are many interesting books and magazines, such as architecture and a subculture. There is an extensive collection of children-oriented books. You can utilize it without an admission ticket! The goods set by the plan exhibition and many museum goods including extremely popular Yayoi Kusama goods are sold. Since there are many unique and lovely goods, please find the goods of your liking. They are best also for souvenirs. As for citizens’ creation plaza in the middle of the art museum, the whole surface is covered with lawn. Good for basking in the sun and picnicking on fine days. A surrounding little stream is also comfortable and you can also enjoy it not only as art appreciation but as a park. There are many interesting spots in the art museum. 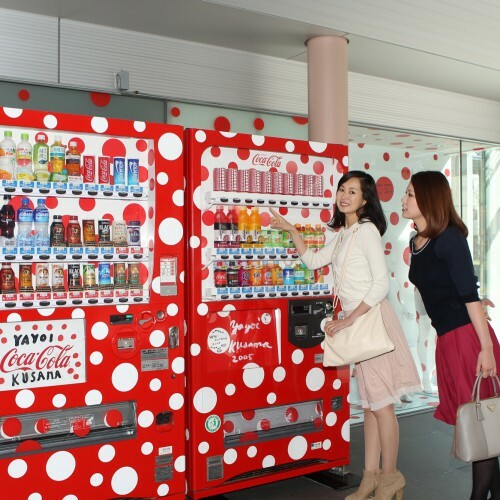 The vending machine designed with Yayoi Kusama’s polka dots seen only in here is a must. In the art museum there is also a casual French restaurant which uses homemade vegetables and local foodstuff abundantly. You can also have lunch in the middle of the appreciation, and taste a dinner fully at night. Please enjoy meals and coffee, looking at a beautiful courtyard. 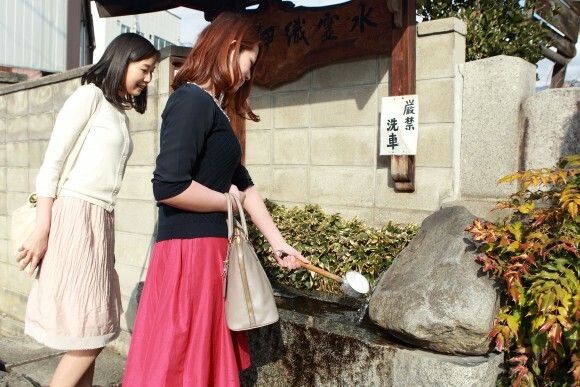 There is much spring water in the Matsumoto City areas, and it is selected for “100 selections of the noted water of Heisei” as “being a castle town spring water group in Matsumoto.” There are also many wells and spring water near Art Museum. There are fully arranged ones and the ones which are difficult to find unless you carefully look. You can enjoy walking while you are doing circulation tour of watersides.